This emphasis on using the tools of government, including the ability to print money and run large budget deficits in times of market failure, is MMT’s most important contribution to the current debate. Now this I don’t get. Sure, MMT says we should run large budget deficits during severe recessions. But so does Old Keynesianism. And post-Keynesianism. And New Keynesianism. If that’s really MMT’s most important contribution, who needs it? In some sense, this all comes down to a question of how scared we should be of inflation. Mainstream economic opinion says that a strong focus on full employment will inevitably risk high inflation, just as our current obsession with low inflation produces generally high unemployment. 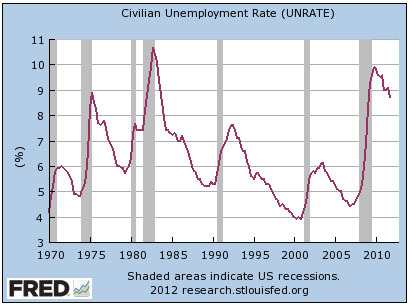 If we were focused on, say, a target unemployment rate of 4%, we’d see some periods where unemployment fell below that rate and some where it rose above it. But as the chart on the right shows, that’s not what we’ve had over the past few decades. Instead, because our economic policy has been focused strongly on low inflation, we see only a couple of brief periods in which unemployment barely got close to 4%, followed immediately by a recession that kicked it back above 6%. So should we focus instead on a genuine target of 4% unemployment, reining in budget deficits only when we fall well below that? That depends a lot on what you think the productive capacity of the country really is, and the mainstream estimate of NAIRU, the highest unemployment rate consistent with stable inflation, is around 5.5% right now. If that’s the right estimate, then you could argue that we’ve been doing OK for the past few decades. But if full employment is really more consistent with an unemployment rate of 4%, then we’ve been wasting an awful lot of productive capacity for nothing. POSTSCRIPT: Of course, you might also want to consider MPT, or Modern Petro-Monetary Theory. Rather than asking what level of economic growth kicks off unacceptable inflation, it asks what level of economic growth kicks off an oil price spike that produces a recession and higher unemployment. I have to admit that I increasingly think of the economy in those terms these days. Your instinct on the oil price is on target, in my view. The inflation threat that we face doesn’t come from deficits or high employment — it comes from the cost and price of energy. But managing this is not within the competence of the Federal Reserve. Our central argument is that stimulus fell short — and would have fallen short even if the amounts had been greater — because increased demand under existing high-fixed cost structures drove, or would have driven, the price of resources too high, too quickly. The constraint on growth was not inflation generated by easy money, but the combination of the rising real marginal cost especially of energy, combined with monopoly control of and speculative instability in energy prices, which together act as a choke-chain on the return to full employment. But the endless debate over deficits, debt and quantitative easing tends to obscure this issue — and in public discourse one cannot easily answer questions that are not being asked. So thanks for making the point, and keep digging at it. Apparently I am a Galbraithian but just didn’t know it.